Apparently some people are attempting to "debunk" BCR Watch using a Tumblr post. Before I start, I'd like to mention that I had no intention of posting my rebuttal to Big Cat Awareness (BCA) because her post did not disprove anything on my website. I'm only posting now because it seems as though Big Cat Rescue's supporters are posting it thinking it somehow debunks my whole website which is just absurd. The fact that Big Cat rescue supporters say my website isn't credible even though I use evidence but believe everything on a Tumblr blog owned by a Big Cat Rescue supporter is very telling. Well, I digress. Lets get started. First: Tony. I mean really you ruined every shred of your legitimacy the second you defended this. You think he has optimal accommodations? Living at a truck stop? He listens to the sounds of traffic, breaths fumes, and has vehicle runoff in his enclosure every time it rains. Alright yeah I totally see your point, Tony def has the superior accommodations. I don’t condone nor do I condemn Tony’s living conditions but I can’t pass up the chance to speak against Big Cat Rescue. Anyway, if Tony were at Big Cat Rescue he would still hear “sounds of traffic” because Big Cat Rescue is surrounded by busy streets and highways. Big Cat Rescue even has a problem with helicopters causing seizures in some of their cats (skip video to 3:35). He would still have “vehicle runoff” inside his enclosure. The reason being, there is a highway right by Big Cat Rescue’s lake as shown in the picture I just linked. Who knows what chemicals from the thousands of cars driving by runs off into the lake that’s part of some of the cat’s enclosures. ​I should also mention how often it floods at Big Cat Rescue which would further spread the possibly contaminated lake water. ​Here is a video showing the flooding problems Big Cat Rescue experiences. Some of you have been asking how we are doing given that it's been raining constantly for days. Here's a peek. It's pretty ugly, but our volunteers are just the best!If you get our annual appeal letter it is because our volunteers use rainy days for hand addressing envelopes to send you our annual report. "12802 Easy Street was a 40-acre dump site, with a small house with a caved in roof and a borrow pit out back. Carole’s mother cried when she saw what her daughter was moving in to, but they needed the acreage for all of the animals. Over the next five years, the junk was hauled away, the house made livable, and the cats moved up from cages to Cat-A-Tats. Today the former borrow pit is a beautiful lake in which Tigers and Swans can swim. The former mountains of trash and construction debris have been converted to a park like setting by Vernon Stairs, (Carole’s father) who does the work of ten men." According to former volunteers, after there was a severe rainstorm, glass, rust pieces, and other debris worked its way to the surface of the property. I'm not sure if Big Cat Awareness was purposely trying to be deceptive by only posting photos of the very few decent enclosures they have. One picture that was posted is of the “Vacation” Rotation enclosure that only houses big cats for 2 weeks. The other picture posted is likely the one that used to belong to Shere Khan. What about the rest of the enclosures that the majority of Big Cat Rescue’s cats live in? BCA also posted pictures of Tony in the concrete section of his enclosure. That's as deceptive as me only posting the feeding section of Big Cat Rescue's enclosures. They aren’t trying to close down zoos and other sanctuaries? It’s all part of their 20 year plan they use to have on their website before it was removed. Their plan ended with all zoos closing down including the reputable ones. They planned on achieving that goal through anti-zoo propaganda. Fourth: BCR is 100% open with their past. It’s on their website and told to people on tours. That they used to breed and buy in the early 90s. And that they stopped that by the late 90s and became accredited in the early 2000s. You know how many zoos or sanctuaries have spotless beginnings? Hardly any. It’s the change they make for the better and their transparency afterwards that matter. But you’re not convinced, I can tell. Let’s go through the animals currently living at BCR shall we? I’ll even bold the ones born/bought in the early days since you think “most” of the cats were bred and bought by them. Amanda, Arthur, Andre(”The Texas Three”): From a bankrupt sanctuary in Texas. Kali: rescued from a bankrupt sanctuary Georgia. Sanctuary went under and was in dilapidated conditions when they were rescued. Keisha and Zeus: Rescued from a bankrupt “sanctuary” in New York. TJ: Rescued from a breeding facility in Florida that was closed when a staff member had been injured, and another killed by the cats. Zabu: rescued from a roadside zoo. Nikita: Found in a basement in a crack house. Ares, Artemis, Orion: Wild born, mother was shot by a hunter before they were brought to a rehabber for some time, then to BCR. Mickey: From a backyard zoo that lost its licensing. Sassyfras: Breeding facility, to private owners, to BCR after the most recent owner took her life. Desiree: Found 3-legged, roadside in the Arizona desert. Frosty: I believe bought at auction in 95. Purrsonality: I believe bought at auction in the 90s. I’ll save you the reading, the other 13 servals living at BCR were ALL former pets from other owners. There are 26 bobcats. This is getting really long so I wont list them all. But of the 26, 10 were bought from fur farms or auctions(BCR got its start with Carole buying out fur farms and auctions to save the cats from however they would end up) with the exception of Windstar who was born at BCR. Now we have some other small cats, the three hybrids(two savannahs, one caracal/serval hybrid) that were rescued from private hands, the one sandcat left that was sent over from a facility in CA, and two caracals who’s origins I’m not sure of(Assuming bought in the early days but I’m unsure). So if I counted right, there are about 86 animals at the sanctuary. 20-22 were either bought from the fur farms in the 90s or born at BCR in the early 90s as well. So 64-66 animals are ALL rescues from other facilities/outside ownership. What was this “most” you were referring to? BCR hasn’t bought or bred an animal since the 90s. Big Cat Rescue is not 100% honest. If they were 100% honest there would be no need for my website. I also rebutted the article Big Cat Awareness linked in her response. On my tour I wasn’t told anything about their beginnings. The guide only played the recorded stories of the cats that we listened to using headphones. Jumanji’s story of him being born at their facility was omitted along with many other cats that were purchased to be bred and sold. There was also no mention of the bed and breakfast they operated in which they allowed cubs to sleep unsupervised with paying visitors. On my tour the only way we could find out about part of Big Cat Rescue's history was if we read a small poster on the fence wall opposite of the wall that had the tv. Only I saw the poster because I was there to absorb everything I possibly could about how their facility looks and operates. The other visitors only came to see the animals and likely didn't even notice this sign with small print due to the fact that they were too busy watching a video being presented to us. Bengali was not rescued but was retired from the circus. The circus paid for his cage to be built and pay for his food. According to Big Cat Rescue's inventory sheets Armani was originally called Amber. She and her sister Jade were bought for $600 each when they were just 10 days old. Armani was used for photo shoots. You do not purchase cats, leash train them, and exploit them for photo shoots and then call them rescues. Jumanji was born at Big Cat Rescue. He attacked a former volunteer.​ His story was hidden for many years until we started exposing that fact. ​He was basically the President of Big Cat Rescue’s pet. Sabre was one of Carole's breeders. He was bred to Nyla to produce Sundari and he was bred to Lola to produce Majik and his brother Jumanji. 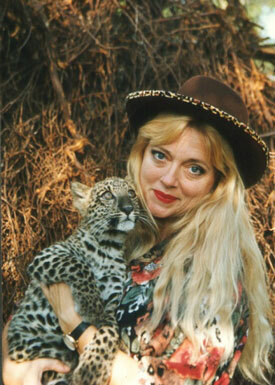 Since you do not rescue leopards to breed more leopards, Saber, Lola, and Nyla were not rescues. Sundari, Jumanji, and Majik, cubs produced from these breedings, were not rescues. Sundari was born at Big Cat Rescue. Not only was Sundari not a rescue, but her parents were also NOT rescues, they were breeders. Sundari's mother Nyla was bought with her litter-mate Simba from David Mc Millan of Tiger's Eye Productions as a baby and later bred to Saber, the father of Jumanji and Majik whose mother was breeder Lola. Here is a picture of Carole Baskin holding her as a cub. Carole had Sundari declawed, as she did all of the smaller cats used as "cabin cats" for her bed and breakfast business. After Sundari's surgery, it was said that Carole passed the claws out to volunteers. Aspen Echo was born at Big Cat Rescue of breeders Catrina (bought from John Ritchey for $650 to be used for breeding) and Hallelujah (bought at auction for $175. and used as a breeder). If Aspen had littermates they are unaccounted for. Carole often says she bought cats from auctions to "rescue" them but you do not buy cats from auctions, breed them to make more cats and call them rescues. The Wildlife On Easy Street Safari Guide tells us, "Aspen was born at Wildlife on Easy Street to parents Catrina and Hallelujah. She sports the kinked tail and mid-back cowlick that are common to the Florida Panther. She is quite nice through the fence, but wants to playfully tackle anyone entering her enclosure!" Tobi is not to be confused with a cougar cub named Toby who came from Nancy Sue Mc Pherson of Ft Myers, Fl and was promptly sold to Sherry Frost of Tampa, Fl. Tobi is one of a total of 10 cougars that came from Deepwoods Exotics of Oneida, TN on 8-18-95 including Lakota, Callie, Sugar, Shadow, Apache, and 4 tiny cubs. Most of these cats were quickly sold, but Tobi remained at Big Cat Rescue. In 1995 a North Carolina man, Timothy Evans (case # 97-08896-B) was attacked by a South American cougar named Tobi and was severely bitten on his left forearm after Baskin irresponsibly invited him to pet the cat which she claimed was "tame and friendly." Frosty was born at Big Cat Rescue of breeders Daisy and Mufasa on 1/1/95 along with littermate Purrsonality. Mufasa was bought at Lolli Bros Auction for $2000.Daisy was purchased for $2200 from breeder John Aynes of OK. Frosty was then bred to Nairobi, bought from a pet shop for $1,000, to produce white servals Kongo and Tonga. A white serval named Pharoah was also born at Big Cat Rescue in 1999. Pharoah was born at Big Cat Rescue in 1999, 2 years after Carole claimed all purposeful breeding ended. Carole bragged about this birth, so it was hardly an accident. The other two white servals born at Big Cat Rescue are Kongo and Tonga whose parents are breeders Frosty and Nairobi. Frosty was born at Big Cat Rescue of breeders Daisy and Mufasa. These 7 cats, Pharoah, Kongo, Tonga, Frosty, Nairobi, Daisy, and Mufasa, were not rescued. Purrsonality and her littermate Frosty were born at Big Cat Rescue of breeders Daisy, bought for $2200 from breeder John Aynes of Oklahoma and Mufasa, purchased for breeding at Lolli Bros Auction for $2,000. Big Cat Awareness is wrong when she says, “the other 13 servals living at Big Cat Rescue were ALL former pets from other owners.” Fluffy was purchased to be a pet or possible breeder. Kalahari was born at Big Cat Rescue. Nairobi was purchased and likely replaced. The reason being, Nairobi was purchased as a male serval but now Big Cat Rescue refers to Nairobi as a female. Bongo was purchased at an auction. Zeus was bought for $380 along with Apollo $380 and a Maverick $380. Unless you believe that it is ethical for breeders to buy cats from fur farms and later call them rescues, these 3 cats, Zeus, Apollo, and Maverick, were not rescued. Purrfection was born at Big Cat Rescue of breeders Samantha and Oakey along with littermate Purr-Sistence. Of the 24 bobcats Big Cat Rescue has, 7 were bought and 3 were born at Big Cat Rescue. The ones that were bought weren’t rescued since Carole bought bobcats to sell, breed, and raise as pets. She left the adults bobcats to possibly be killed or “however they would end up.” Windstar, Little White Dove, and Running Bear were born at Big Cat Rescue. The two caracals Big Cat Awareness mentioned were born at Big Cat Rescue. Don’t blindly believe people like Joe Schreibvogel and his ilk, from whom most of these lies come. BCR is one of the best forces out there for big cats and gives OUTSTANDING care to the animals that rely on them. They are constantly changing and expanding, they had a full surgical suite and functional hospital building with recovery areas for all the cats big and small, as most of them are geriatric and need advanced veterinary care. They are a true sanctuary. Btw I have torn apart the 911animalabuse pages in the past. But I guess I’ll just stop here. The tumblr user posted my website but then talks about 911AnimalAbuse.org. I’m not connected to Joe Schreibvogel. I’ve researched everything posted on my website so there are no lies. I own no exotic cats so I have nothing to gain with my website and I have nothing to lose if I take down my website. Also Big Cat Rescue is not a "true sanctuary" because they exploit their cats to the public through daily tours. They also offer weddings and parties. 4. Carole’s 20 year plan has been edited, by other people multiple times and twisted a million times. I’ve actually spoken to her personally about this before. Her 20 year plan is to get legislation passed and make enough difference for big cats in the US that sanctuaries, INCLUDING HERS, are no longer needed and can go out of business. Not wanting zoos to be around at the end of the timeline is coming from the fact that she would like enough of a difference to be made for big cats that they are NO LONGER NEEDED. Is it realistic for this to be done in the 20 years she has set? No. What, when she hits the end of her timeline is she going to go and set fire to all the zoos??? Are there anti-zoo people at BCR: yes. And I don’t agree. Is everyone at BCR anti-zoo? NO. Many of the volunteers either have been keepers in the past or move on to be keepers. In the 20 year plan Carole said the plight of wild cats would be such a lost cause by the time she starts attacking zoos. So does it sound like she planned on making a difference for big cats? 5. Yes they lobby against hybrids because hybrids are IRRESPONSIBLE. Congrats on thinking a few short videos of a hybrid cat being affectionate completely dismantles the fact that: sanctuaries are so inundated with requests to take hybrids that they have to straight up say NO savannahs/bengals/etc., breeding wild cats to domestic cats is extremely dangerous, the wild genes undeniably come with behavioral problems, they are extremely specialized animals. Get a domestic cat. Breeding them to wild cats for cool new hybrids is irresponsible and unnecessary. ​I won’t bother rebutting the claims about hybrids domesticated cats. Owners of domesticated hybrid cats have already dismantled all of Big Cat Rescue’s claims and the claims put forth by other “sanctuaries”. Carole thought they made fantastic pets and I think she still has one as a pet as indicated by ​her Facebook profile picture that showed her bengal perched on her shoulder. Just in case a Big Cat Rescue supporter tries to argue saying the cat on Carole's shoulder isn't a bengal I'll post evidence proving that it is. Below is a screenshot a hybrid cat owner took of their conversation with Carole Baskin. The conversation was about her profile picture with her pet bengal on her shoulder. Carole had purchased many bengals and in her exotic cats as housepets video she said bengals have a tame personality, eat cat food, and use litter boxes. 6. Congrats on spending a “day and a night” reading those links, which I already discussed and have already looked at. I actually know the sanctuary and the cats first hand. And the only lies here are yours and theirs. But here I finish, and as I said before this will be my last time speaking to you. Fortunately there are plenty of people that don’t actually believe all that nonsense, so if you still wanna run around spewing lies(I’m sure you think they feed all the cats live rabbits too), that’s fine. ​Big Cat Rescue had the rabbit picture with the volunteers happily smiling while holding bloody rabbits copyrighted. Maybe we should talk about Carole having live chickens thrown into the cats cages? Or maybe when Carole said she hears multiple voices in her head telling her what to do?